The World Trade Organisation cannot be deemed truly international without the full participation of China, a massive market with an increasing number of highly sophisticated sectors. Yet¿although China did accede to the WTO in 2001, after fifteen years of negotiations¿WTO members persist in classifying China as a non-market economy, with all the trade restrictions such labelling entails. The EC in particular continues to curtail the flow of Chinese-European trade, despite some recent liberalisation in EC import and antidumping regulations. the ¿translatability¿ of Western social and political institutions. Addressing as it does a highly salient present and future aspect of the global economy, EC Trade Law Following China¿s WTO Accession will be of enormous value to policymakers in international economic law at all national and supranational levels. The author¿s reasoned and cautious analysis builds a sound platform for the ongoing development of peaceful and mutually beneficial commercial relations between Europe and China. Avant-Propos; A. Neyts-Uyttebroek. Acknowledgements. Abbreviations. Introduction. Chapter One: Of Bretton Woods, The WTO and The Integration of Transition Economies. I. Bretton Woods, Free Trade and the World. II. Role of the WTO. III. Market Economy. IV. Legal System. V. Final Observations. 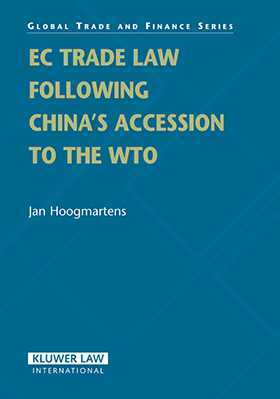 Chapter Two: China¿s WTO Accession and Domestic Economic and Legal Related Reforms. I. Socio-political and Historical Background. II. Domestic Economic Reform. III. Domestic Legal Reform. IV. Final Observations. Chapter Three: EC Trade Policy Response¿Safeguards and Market Disruption. I. Reasons for Concern. II. WTO Adjustment Mechanisms. III. Emergency Safeguard Clause. IV. Textiles Regime. V. Note on Agricultural Products and ECSC Products. VI. Final Observations. Chapter Four: EC Trade Policy Response¿Antidumping. I. The Economic Context of Dumping. II. The Legal Context of Dumping. III. Antidumping and State-Trading Countries. IV. Final Observations. Chapter Five: Conclusion. Bibliography.